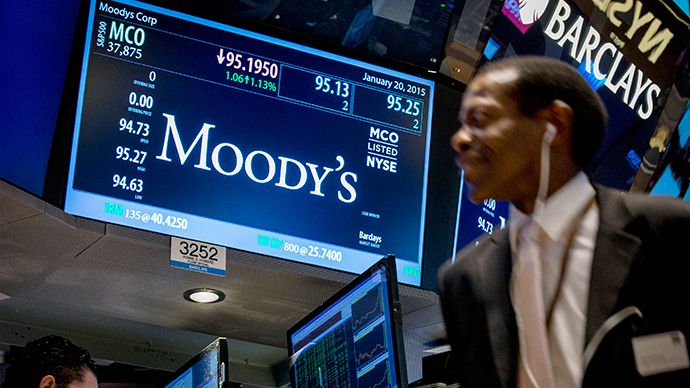 US authorities are stepping up the investigation against Moody’s rating agency for issuing favorable ratings on mortgage bonds to win business before the 2008 global financial crisis. Attorneys General in Connecticut and Mississippi said they were among the prosecutors stepping up their examination of Moody’s, the Financial Times reports. Officials from the US Justice Department have met a number of former executives of the New York-based ratings firm in recent months to clarify the mechanism of issuing ratings on mortgage deals. However, it is unclear whether the investigation will result in a lawsuit. In February 2013, the Justice Department filed a lawsuit against Standard & Poor’s Ratings Services over rosy residential mortgage bond grades issued in the pre-crisis years. On Tuesday, S&P agreed to pay a record $1.4 billion settlement. The agreement consists of two major payments: $687.5 million to the US Department of Justice and another $687.5 million to 19 states and the District of Columbia, which all sued the credit rating agency. “Our office intends to pursue the Moody’s case now that the S&P case is resolved,” spokesman for George Jepsen, Connecticut’s attorney general, was cited as saying after the attention has switched to Moody’s. In response, Moody’s said: “We continue to believe that the cases are without merit,” the Financial Times reports. Investors usually rely on ratings from S&P, Moody's and Fitch when deciding whether to buy bonds. The three issue about 95 percent of credit ratings globally, and this hasn’t changed from the pre-crisis years. In the pre-crisis era, many investors bought mortgage-related securities, guided by the positive assessments of the 'Big Three.' Later they suffered huge losses when the mortgage market collapsed. As the criticism of the 'Big Three' grew, with many analysts accusing them of inaccurate assessments, Russia and China decided to start their own credit rating agency in 2015. The new agency is to be based in Hong Kong.